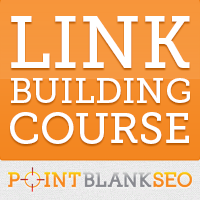 I usually don't buy link building course because i use to believe i already know enough but i am a constant subscriber of seo blogs i am following pointblankseo from over a month after reading many post over a week i realize how much more i have to learn, when it comes to link building you have to think out of box. Things like getting links from twitter profiles, or getting links via paying some webmaster for hosting was something that i have neither heard or read in any blogs all i use to get same old rehashed ideas like do article submission do forum postings blog commenting and everything else was just repeated over and over again. This course is truly a gem and highly recommended not just for beginnings but also for an expert now i believe seo is ever changing and you need to keep updated with new link building ideas. Rare Collection on Link Building Ideas: If you are "pissed off" by reading same techniques over and over again then this course will truly blow your mind some tips were short but they were so unique that i called myself why i haven't thought this way i was surprise that links can be achieved with so many different tactics but we are still using old school methods. Access To Resources: They also get you acess to hundereds to website where you can easily get links for that too with high page rank and authority currently i am using those resources on one of my project and i am watching good results on my rankings. SEO Tools: There are dozen of tools out there but we either don't know about it some of them can cut your seo time in half on this course you will also get to know about lots of recommended seo tools. Latest Information: Problem with seo methods is that they gets outdated really fast what techniques working right now might not work in future what best part about this course was all content were upto date according to the latest seo trend. But above all best things i like overall was all these things i have found in one place i don't have to wander around to find all these.!! If you are doing seo or if you are an seo expert then missing out these can be like dropping off a diamond.